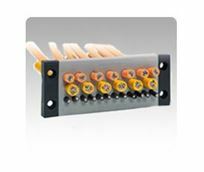 KEL-DPZ entry plates are designed for routing standard cables (without connectors). The KEL-DPZ products are a cost saving alternative to traditional cable glands. Either push the cable through the thin membrane or simply put a small slit in the thin membrane and push the cable through. Once the cable is through the membrane, it is immediately sealed and strain relieved. ST Plugs can be used for sealing pierced membranes if cables are removed.